If you love stepping out of the ordinary and using sites like JibJab to send virtual eCards, you will absolutely love browsing our list below. JibJab is one of the best eCard sites online that allows you to send personalized virtual cards of all genres. With a huge selection of eCards for any occasion and true simplicity of use, you’ll have a blast making funny image creations and personalized videos. On this site that lets you send an ecard from wherever you might be, you will find a ton of options to bring your cards to life, making them a lot better than your traditional cards. The animated greeting cards on JibJab are easy to create, even for children. JibJab lets you put your face on famous figures like George W. Bush, Disney characters, and even Santa Clause during the holiday seasons. Watch as your card comes to life and dances to a fun song with each animated card that you make with JibJab. If you want to send something unique to someone you love, try JibJab today, you won’t be disappointed. There is a huge amount of sites like JibJab online but only a few of them actually offer quality eCards. Also, only a few of them offer free eCards that you can send without limitations. We’ve listed all of the best of them below so you can send free eCards online or pay for premium eCard services. Make sure to browse our list below and share it on your social media accounts so your loved ones and friends and send you really awesome eCards too! Among the best and most popular eCard sites like JibJab, American Greetings offers an incredible selection of virtual cards online. They have a huge selection of categories available to choose from as well as Happy Birthday, Get Well, Thank You, Happy New Year’s, and Happy Kwanzaa. You will also find funny ecards that can be sent anytime you want, without the need for an occasion. 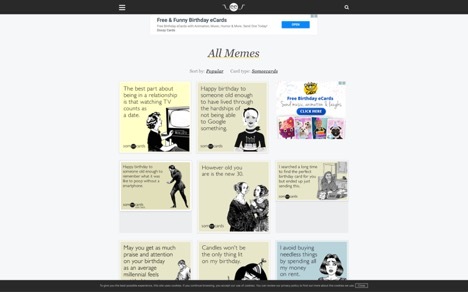 Whether you want to send birthday cards, get-well cards or even personalized eCards, American Greetings will help you create and send the eCard of your choice with ease. 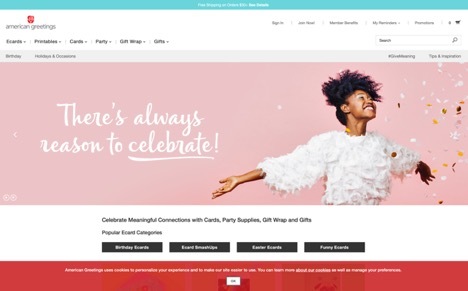 There’s something for everyone, for every occasion on this site, check out American Greetings now to get started. Blue Mountain is one of the free eCard sites that you definitely won’t want to miss out on. As one of the top JibJab alternatives online, Blue Mountain has a massive selection of categories that you can choose from including still images, animated videos, funny backgrounds and so much more. Simple and amusing to use, Blue Mountain is surely going to make you and your friends laugh every time. 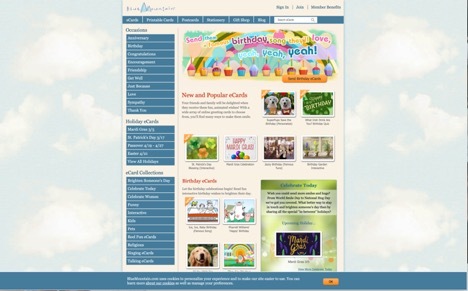 Add a voiceover and choose from over 100 different templates to get started on this top site for free greeting cards online. Blue Mountain has free calendars that you can print out too so you can keep up with every day of the year and never forget special occasions to send out a card to someone you love. Enjoy thousands of free virtual cards online with one of the best sites like JibJab available online with PunchBowl. 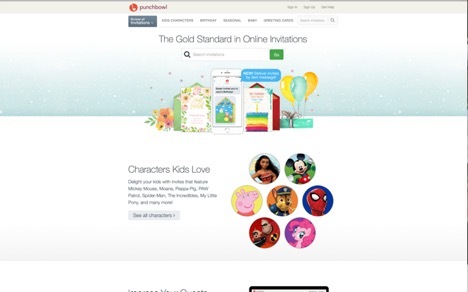 This site considers itself to be the gold standard in online invitations. PunchBowl specializes in all sorts of hilarious eCards that will get your friends and family members laughing. Whether you want to send birthday cards or thank you notes, PunchBowl has all the free email cards that you’re looking for. Search for characters you love like Spiderman, Mickey Mouse, Elmo, and PAW Patrol or go for something more sophisticated by using calligraphy and artistic techniques. PunchBowl is great for moms, for kids, and for special events like fundraisers and charity balls. If you want to start off your party right or thank someone you love just for being who they are, check out PunchBowl now to get started on your cards that can either be printed out or send directly to someone’s email. Another one of the excellent places like JibJab online is Some eCards. With a huge selection of virtual cards spanning over a ton of different categories, you will easily find the best eCards for your needs. Some eCards is the ideal place to send virtual cards and short videos with music. You’ll find tons of hilarious videos that will get all of your recipients laughing like never before! If you’re searching for simplicity, Some eCards has a ton of memes that are guaranteed to make your loved one smile. These memes include a picture and a quote or a short message. Sometimes short and sweet is exactly what you need, if that’s what you’re searching for, check out Some eCards now. Share your meme on email or on social media with one simple click, making someone smile any time of the day with this site.